Expertly crafted, bespoke oak porches delivered as a kit, ready to assemble. 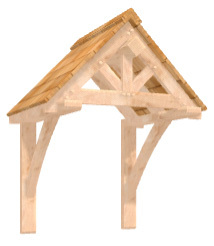 All generated images are © Copyright Oak Timber Structures Ltd and protected under copyright law. See this porch on your own house. Click here to upload your own photograph. On computers and web browsers that support it, there's usually a 3D spinning model here that you can edit with the controls below. We're sorry but it doesn't look like your computer or device can run our interactive builder. It will run on most modern computers with an up-to-date web browser. We're sure you'll love our builder so please try on another computer if possible, else please feel free to email your requirements or drawings to enquiries@iwood.co.uk. Untreated cedar shingles - Untreated shingles can be installed as they are or you can apply your own treatment or stain. Although untreated, these shingles will last 25 - 35 years depending on the amount and range of weather exposure. Treated cedar shingles - These pre-treated shingles will last a further 10 - 15 years over our untreated ones and provide greater resistance to mould in damp environments. None - No shingles are supplied so you can either source your own or fit your choice of tiles. 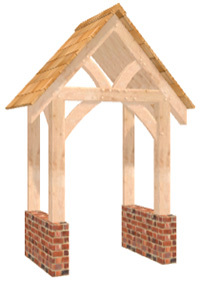 These porches are very strong and are more than capable of supporting standard roof tiles. See this porch on your own house. Click here to upload your own photograph. Use these controls to position the Porch over your photograph. Oak Timber Structures thrives on quality and reputation as well as keeping costs to a minimum for the customer. 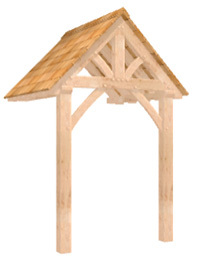 All of our oak framed porches are made from solid oak. The oak framed porch sections are planed all round and lightly sanded for a smooth finish and are held together using traditional mortice and tennon jointing. They include a set of kiln dried oak pegs, and all holes are pre-drilled and supplied in a kit form ready for the customer or builder to put together. 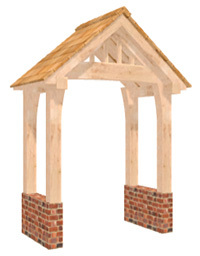 We erect all of our oak porches, code each section piece and then dismantle them for ease of shipment. Our oak porches slot together perfectly and are then secured by knocking in a number of the kiln dried oak pegs, which will tighten the oak frame up even more over time. 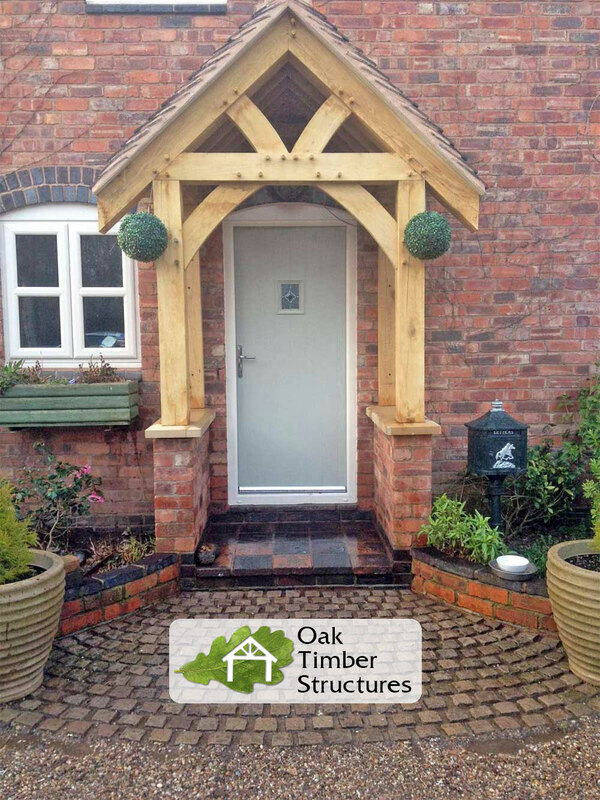 The oak framed porches will add a natural and elegant appearance to any home and will give you and your visitors that luxurious, homely feel when walking up to the property.
. We can make any oak porch you require. Feel free to call us on 01889 597 283 to discuss. See more porch photos in our general photo gallery. Available to buy above in standard size or get in touch for a bespoke quote. Every porch is completely bespoke, so we can make you any style at any size. Send your sketches through to us for a quotation. If the exact porch you want is available above, you can place your order securely on this website, or call us to place your order.